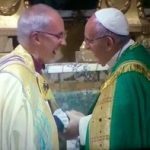 I note the statement published on January 17th, 2017 by Archbishops Welby and Sentamu of the CofE on the issue of the 500th Anniversary of the Reformation. What they have said deeply saddened me, and is a further sign of the movement that the CofE is making away from the true gospel. There is too much of note in the statement to cover it all here, but I present this one thought as a marker of how far from true Biblical Christianity the CofE has now sunk. In their statement the archbishops note ‘Many will also remember the lasting damage done five centuries ago to the unity of the Church, in defiance of the clear command of Jesus Christ to unity in love.’ Unity must not be maintained if compromise of our faith is what it takes to do so – for Christian unity can only be found between faithful followers of Christ, and through faithful obedience to God’s Word as revealed in Scripture. Man cannot create, or seek, such unity. We are united in Christ’s truth, or we are not united in anything that matters (John 17). It should be noted that In 2 Corinthians 6.17 it reads ‘Wherefore come out from among them, and be ye separate, saith the Lord…’ Clearly this is what the reformers had in mind when the Church they left was unwilling, if not able, to reform. The separation was not unfortunate but necessary and therefore perfectly justifiable. Christ said he would divide. He did, and does. Christ criticizes the Church of Thyatira for tolerating Jezebel. Therefore, either you eject Jezebel; or, if it is Jezebel that holds the levers of power, it is necessary for you to remove yourself from her influence. There is nothing to repent of in leaving the Church of Rome to its errors, nor in pointing out those errors and thereby seeking to lead people to the truth and light that is to be found in Christ alone, and in the Scriptures alone. Please pray for these men, that God’s Spirit will invade their hearts with his transforming power. Please pray for the Church of England, that it will be restored to the Protestant body that it once was. Please pray for our nation, that it will have spiritual leadership that will lead it to Christ, and who will encourage us all to trust in God’s Word as the sole rule for our faith and practice.